With the first school kitchen garden at Apia Primary School, Malifa launched, a second garden is being planned for Poutasi Primary School. The project designed to combat non-communicable diseases is supported by the Canada Fund for Local Initiatives, the Tiapapata Art Centre Inc. and the Ministry of Education, Sports and Culture. The project targets children at the primary school level to help them gain a taste and an appreciation for vegetables, spices and herbs. It is hoped that teachers and the families of the children will replicate the idea as home kitchen gardens. 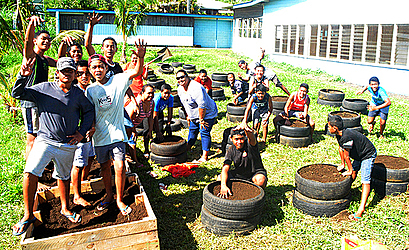 The students at Apia Primary School are excited with the project and filled the boxes and used tyres last Saturday. The garden utilizes boxes constructed from wood pallets and used tyres, which are usually discarded and are otherwise toxic to the environment. Tyres also collect water and are a favorite place for mosquitos to breed. Ten cubic metres of topsoil delivered by Apia Concrete Products last week was manually moved the 100 metres to the garden site by the children using wheelbarrows, bags and even a Samoan basket. Most of the garden tools were purchased from Samoa Builder’s Supplies at a generously discounted price. These tools will be used by the children to plant a selection of vegetables commonly grown in Samoa. Primary school kitchen gardens are not a new concept in formal education at this level. The Stephanie Alexander School Kitchen Garden Foundation in Australia has established gardens in over 800 schools and has developed many resources to help teachers make linkages with the mainstream curriculum. When foreigners began to arrive in the Samoan archipelago, they observed a strong and healthy race. How the poet would describe Samoans one hundred year’s later is a matter of conjecture but, as reported by the World Health Organization in 2015, with some 75% of the adult population obese, he may not have been so flattering. The difference can be directly attributed to Samoans changing from a traditional diet that was mainly vegetarian, to a diet rich in fat, salt, sugar and processed food including bread. While there is a common myth that large bodied people are happy, there is conclusive evidence that obesity is a serious, chronic disease that can have a negative effect on many systems in the human body. People who are overweight or obese can have increased blood pressure and are at much greater risk of developing serious conditions, including heart disease, Type 2 diabetes and even some cancers. 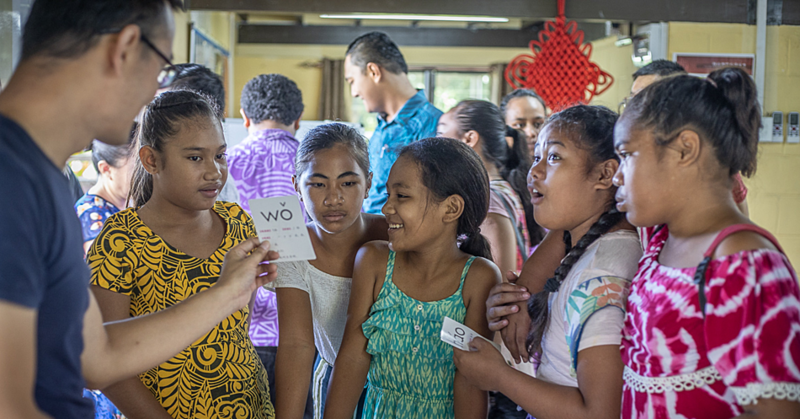 After a brief ceremony at the garden, the introduction and part one of the documentary film series on non- communicable diseases, “O le Pologa Tau’ave – The Heavy Burden,” were screened with the two classes, some parents and teacher present. This was followed by a brief conversation on the N.C.Ds health crisis facing Samoa. Up to 100 parents, mostly women, take their children to school and wait all day before heading home when school ends. Mr. Tagiilima, the Principal of Apia Primary School, has invited the parents to participate in the launching of the garden given the important role they play in providing food and nutrition for their children both at home and at school. 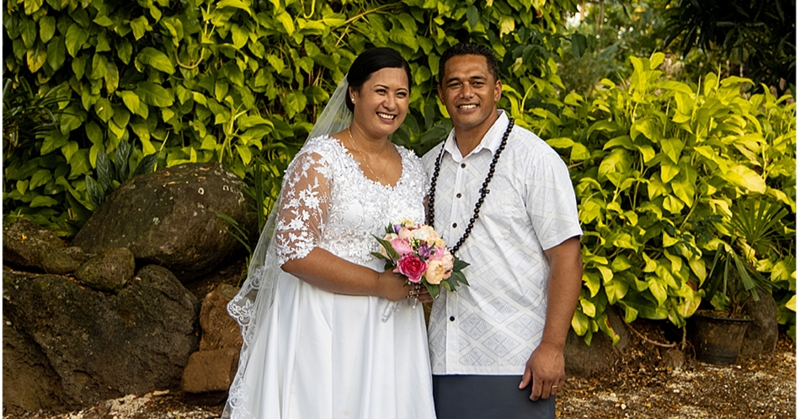 One of the issues facing Samoans is that they do not seem to make the connection between food and diseases and this subject is considered by the filmmaker as one risk factor that requires much greater attention. Take Pisupo, corned beef, a food product with a high fat and sodium content. The meat in pisupo is preserved with sodium nitrate or sodium nitrite, and like other processed meats is linked to a range of health risks including heart disease, cancer and Type 2 diabetes. The International Agency for Research on Cancer (I.A.R.C. ), the cancer agency of the World Health Organization, has evaluated the carcinogenicity of the consumption of red meat and processed meat. Reviewing more than 800 studies, a working group of 22 experts from 10 countries found processed meat such as corned beef, ham and bacon as cancer causing in humans, in the same class as tobacco smoking and asbestos. The consumption of red meat was classified as probably carcinogenic to humans. Pisupo is now an iconic cultural product of ritual exchange and gifting in Samoa. Researching for the production of The Heavy Burden, it was discovered that the Heart Foundation of New Zealand features a “healthy heart” recipe for Pacific people using pisupo. Also featured for Pacific Islanders in New Zealand are healthy recipes for salt beef and mutton flaps. These recipes seem to suggest that Samoans and other Pacific Islanders are truly addicted to fatty meats and cannot change their diets. While pouring off the soluble fat, cutting away solid fat and adding more vegetables may make the food less harmful, it is still harmful. It is not surprising that the driving force behind these “healthy heart” recipes targeting Pacific Islanders is Beef and Lamb New Zealand who pursued the Heart Foundation healthy recipe tick in its Marketing Plan for 2008 – 2009. It is not surprising that Samoans and other Pacific people in New Zealand feature prominently among those suffering from non-communicable diseases including overweight and obesity. In a bold attempt to reduce the incidence of obesity, the government of Samoa banned the importation of turkey tails in 2007. The restriction, as later reported to the World Trade Organisation, was imposed owing to Samoa’s high levels of non-communicable diseases, especially diabetes, obesity and heart disease. Six years later, in 2013, when Samoa was finally admitted into the W.T.O. it came with the condition that the discriminatory ban be lifted and so in 2013, Samoans were again able to eat what most other humans will not. The value of turkey tails imported into Samoa in the five years leading up to the ban reached a peak in 2006 with a CIF value of $6.758 million, a massive 3,332 Metric Tonne of an offcut of no commercial value to humans in the developed world but of some value when processed into dog and cat food. Almost 98% of the turkey tails were imported from the United States of America where some 250 million turkeys are raised on turkey farms. But you won’t find any turkey tails in American supermarkets. The great challenge is how to change a society’s eating habits. As stated by Tuitama Leao Dr. Tuitama, Minister of Health, the term “non-communicable disease” is a misnomer. They are in fact socially transmitted diseases and if Samoa is to reduce this escalating health crisis, the food choices people are making need to be re-examined. Perhaps this is one example of the need to revisit the past in order to survive the future.